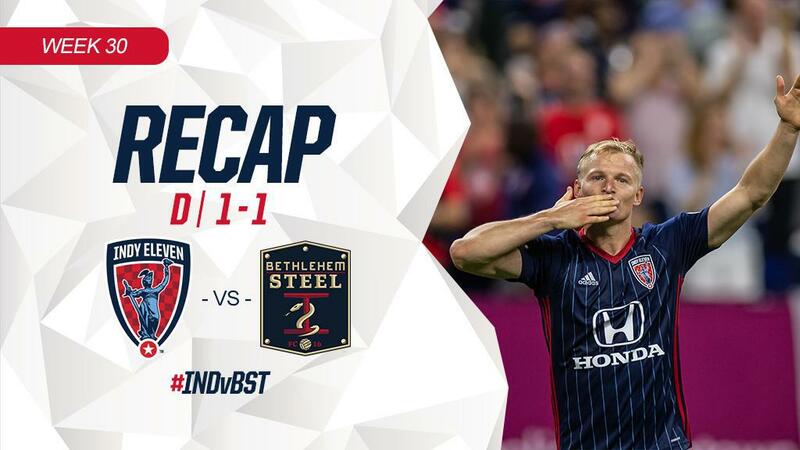 Indy Eleven played its final regular season home match of 2018 to a 1-1 draw against Eastern Conference contenders Bethlehem Steel FC. Indy Eleven forward Eugene Starikov scored the equalizer in the 61st minute to save a point in front of a crowd of 14,894. Steel FC controlled the tempo in the first half and kept the “Boys in Blue” pinned in their defensive half. Indy goalkeeper Owain Fon Williams recorded a key save in the 16th minute, as he deflected Steel FC forward Faris Moumbagna’s shot from near the penalty spot. A turnover in the midfield resulted in a quick Bethlehem counter in the final moments of first-half play. Steel FC midfielder Brenden Aaronson played a pass down Indy’s left flank that free Moumbagna. Indy defender Carlyle Mitchell was in pursuit of the streaking forward, but Moumbagna broke away from the Trinidadian to net the first goal of the match. Fon Williams was nearly able to save the attempt, but was unable to as Steel FC took a 1-0 lead in the 39th minute. The second half script flipped for the home side. “Indiana’s Team” played much of the second half in the Steel FC side of the pitch. As a result, “Indiana’s Team” created 10 shots compared to Bethlehem’s two in the final 45 minutes. Indy’s persistence paid off when forward Eugene Starikov leveled the game in the 60th minute. Eleven defender Ayoze played a nearly 60-yard through ball that created the shot for Starikov. The 29-year-old forward chipped the ball off the bounce over the head of Steel FC goalkeeper Tomas Romero from the right side of the 18-yard box. The high, arching shot brings Starikov’s goal total to six in his first season with “Indiana’s Team”. Fon Williams recorded another crucial save in the 83rd minute of the match. Bethlehem substitute Chris Nanco tore down the right flank and into Indy’s 18-yard box before unleashing a powerful, one-verse-one shot that Fon Williams parried wide for a corner. At full-time, the Welshman finished his shift with three saves total. Late heroics from Indy forward Jack McInerney and midfielder Dylan Mares nearly won the “Boys in Blue” the match in the 86th minute. A throw-in from defender Reiner Ferreira found McInerney on the inside Bethlehem’s 18-yard box. McInerney attempted to bicycle kick Ferreira’s throw, but the shot was deflected to Mares at the edge of the box. Mares continued the acrobatics with a scissor kick attempt that flew inches over the bar as the score stayed level at one for the remainder of the evening. Point accumulation was crucial as Indy Eleven head coach Martin Rennie’s side continues to fight for a playoff position. “Indiana’s Team” continues its “Fight to the Finish” to secure a playoff spot on the road against Louisville City FC on Saturday, October 13, at 7:30 p.m. Catch the final match of the 2018 regular season on MyWNDY 23 or on ESPN+. New users can sign up for a seven-day free trial at plus.espn.com. Saturday, October 6, 2018 – 7:00 p.m.